Watford host Liverpool at Vicarage Road on Saturday in their first Premier League match of the 2017/2018 campaign and the Hornets are expected to give the Reds a tough fight. 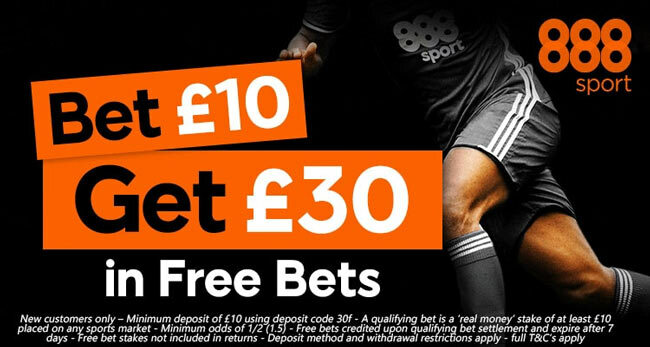 Read below our Watford v Liverpool betting preview with predictions, betting tips, starting lineups, team news, enhanced odds, exclusive bonuses and no deposit bonuses on the Premier League opening weekend! Watford, who ended just one place above the relegation zone and finished last season by losing six matches on the row, have lost three consecutive matches against Liverpool, including the two games played last year - 6:1 at Anfield and 0:1 at Vicarage Road. Anyway, they are unbeaten in their last 10 opening day league games (W5 D5). Their pre-season has been rather low key, with them beating Viktoria Plzen and Eibar but drawing against Woking, Aston Villa, and Real Sociedad and losing to Wimbledon. The Hornets have not changed very much the team this summer, signing only midfielders Tom Cleverley and Nathaniel Chalobah, strikers Andre Gray and 20-year-old Brazilian Richarlison. Head coach Marco Silva revealed Troy Deeney is unlikely to be fit to start. As a result, club-record signing Andre Gray could be thrust straight into the starting XI up front, with Stefano Okaka and Jerome Sinclair the other options. Roberto Pereyra hasn't played competitively since December but has featured in pre-season and his return will be a welcome boost. Nordin Amrabat and Tom Cleverley are likely to complete the trio of offensive midfielders. Nathaniel Chalobah and Abdoulaye Doucoure could combine at the base of midfield with Daryl Janmaat, Younes Kaboul, Miguel Britos and Jose Holebas forming the back four. The likes of Craig Cathcart, Christian Kabasele and Mauro Zarate are all ruled out. Liverpool were impressive in pre-season, especially at the Audi Cup where they destroyed Bayern Munich 0-3 at Allianz Arena, before to lose to Atletico Madrid in the final. They where they were victorious in four of their five games and triumphed in the Premier League Asia trophy, beating Leicester and Crystal Palace in the process. Their roster has been strenghtned by the arrivals of Mo Salah, Andrew Robertson and Dominic Solanke but their defence is still an area of concern and they still look a few players short of being genuine contenders. As to the stats, the Reds have won 8 of their last 9 matches against Watford in all competitions. Philippe Coutinho has missed Liverpool's last two pre-season matches with a back injury and has declared he would like to leave the club and join Barcelona. Adam Lallana has been ruled out for three months with a thigh injury, while Jordan Henderson has recovered from a virus though, so he could start alongside Emre Can and Georginio Wijnaldum in a three-man midfield. Up front, Roberto Firmino is expected to be flanked by Mo Salah and Sadio Mane. Trent Alexander-Arnold is set to deputise for the injured Nathaniel Clyne at right-back, with Alberto Moreno starting on as left- back after an excellent pre-season. Simon Mignolet and Loris Karius are still battling to be Jurgen Klopp's first choice goalkeeper. 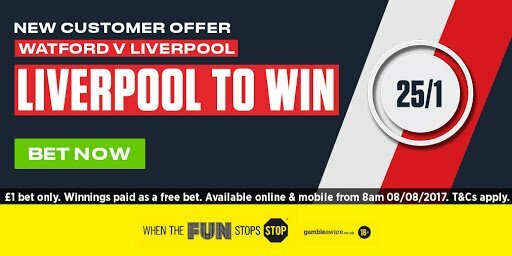 Ladbrokes offer 25/1 Liverpool to win + money back if you lose! "Watford v Liverpool predictions, betting tips, lineups, odds and free bets (Premier League - 12.8.2017)"